This area of central Germany attracts visitors looking rent holiday homes in Thuringia, Thurringen in search of the long historical culture and ancient towns like the Kyffhauser hillas where legend tells us that this is the sleeping place of Emperor Barbarossa in his underground palace. During your stay in rented self catering accommodation in Thuringia it is popular to try the local speciality protected by EU directive for authenticity of the Thuringer Rostbratwurst cooked on a charcoal fire. The selection of holiday accommodation on offer below reflects varied towns and villages that are located here from the historic medieval city of Erfurt to the famous Eisenach which is the birthplace of Johann Sebastian Bach and the Wartburg Castle. 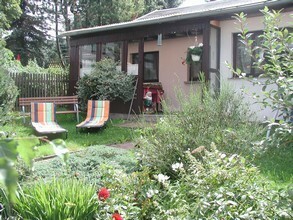 If you wish to rent a holiday home in south east Thuringia and be close to the slate mountains and their nature reserve which offers excellent panoramic views over the surrounding countryside of valleys and forests. You will not be far from a national park or area of natural beauty like the famous Rennsteig one of the country’s best know trails through the Hainich national park and the winter sports town of Oberhof.